I am thinking about a story or a laugh that day. Tabula rasa. Well maybe I might have turned heads. I think I am very confident when I do the effort and actually dress up well. This time counted. But really it just comes days when you’re in front of your closet and you’re wishing the outfit of your dreams to just appear like that, because you’ve already worn that, that, and that. Right now, I am having a lot of speculation for spring trends so I have several outfits in mind that I cannot wear yet because the weather is still too cold. Too bad. I bought this shirt from Topshop recently. It says “you’re just a drummer, not a rockstar” and there’s the UK flag on it. I like the sarcasm of it. 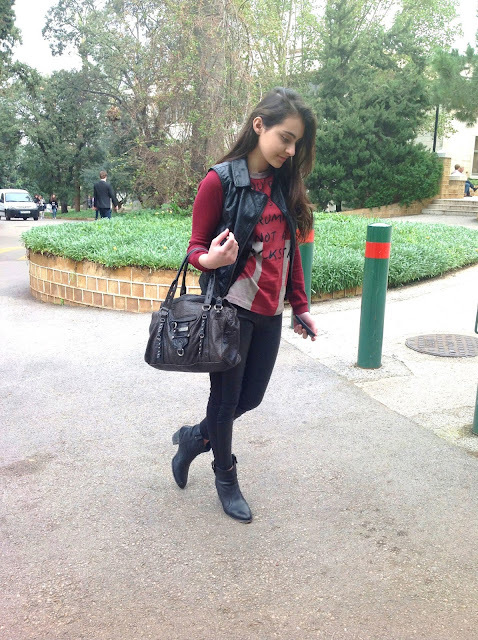 I was wearing a Topshop shirt, Mango bi-color (red &black) cardigan, Zara leather legging, H&M leather vest, Kurt Geiger shoes, Juicy Couture leather handbag, and YSL sunglasses. P.S. These pictures were taken on campus of the big and beautiful American University of Beirut (AUB).